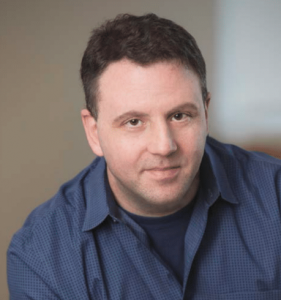 Can Technology Solve the Expanded Risks of Multi-Asset Trading? Multi-asset trading requires a dynamic combination of available technology, broker partnerships, an educated trading team, and belief in the importance of human oversight. As multi-asset strategies proliferate, more and more traders are being asked to expand their knowledge base beyond a single asset class to include a host of new instruments. To be successful, these traders need to master the mechanics of these new asset classes, be aware of a whole new array of risks, and take a new approach to risk management. For the multi-asset (M-A) trader, risk management is less a concept than it is a way of life. From a pure trading standpoint, risk is as broad as the asset classes the M-A trader navigates. And while not all risks will be new to the equity trader, multi-asset requires an understanding of risk across the full spectrum. Risk awareness needs to be front-to-back, from reconnaissance to, in many cases, the last line of defence. Moreover, unlike in the world of equities, technology is not going to offer seamless support. M-A traders must finesse among multiple and imperfect systems, and gain consistency not from technology, but from human understanding and oversight. The diagram below illustrates the multitude of risks that many traders deal with on a daily basis. While breaching any of these can lead to adverse results, in equity trading there is typically an understanding that many downstream risks are being systematically managed and can be largely assumed to be under control. For an M-A trader, choosing which to focus on or ignore is not an option. Trading multiple products, in multiple venues, with multiple trading partners means having to understand not only the inherent front-end execution nuances in each, but also their back-end processing mechanisms, as well as an awareness of all issues related to regulation, settlement and compliance. Understanding the context of the trade at hand is the key to the determination of strategy. Here the M-A trader serves as the fulcrum, bridging from the portfolio manager’s desired exposure (and reasons for wanting that exposure) to management of execution risk to all of the downstream dynamics of the trade – including fees, clearing and settlement. 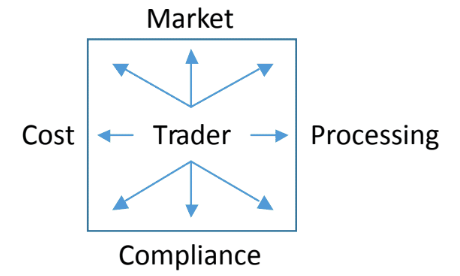 Often this is in the context of structured products and other complex instruments, where the trader works directly with a broker to tailor a unique position. This combination of knowledge also gives traders the opportunity to offer their insight back to the portfolio managers in the form of idea generation and position protection. Impact risk, both from explicit and implicit costs, is much more complex in multi-asset. When you move from the well-defined cost analyses for cash equities to the more specialized roll costs determination and trend analysis for futures; seasonality and roll yield analysis for commodities; interest rate curves and flow measurements for foreign exchange and fixed income related products; and balance sheet usage and funding requirements for over-the-counter (OTC) products, it is clear that not knowing every aspect of M-A trading can have material impact on performance. Compliance issues are also much more at the forefront of M-A trading. Multiple products mean multiple regulatory environments and multiple forms of compliance risk. Futures and options mean understanding margin risk. OTC trading requires attention to credit and counter-party risk. Consideration of these risks plays directly into the trading process. How can firms most effectively create a trading team that can accomplish this? Education is the key. In addition to training on instruments, operations and regulations: don’t ignore the opportunity to learn from the sell-side. Relationships are essential to the success of multi-asset trading. Viewing the sell-side as a partner, with ideas and experience to offer, can be very productive. Gone are the days when a trader can simply worry about execution and leave the rest in the hands of technology overseen by others. While there are platforms that can address some needs, they are not all easy installs and do not come cheap. Reporting platforms for post-trade exposure management (by rule, regulation, product, counterparty, etc. The hazards of notional calculations, performance and fee payments, credit facility usage and collateralization – to stress just a few – means that the M-A infrastructure needs to be designed with the mindset that back-end processing is equally as important as front-end execution. Think of the audit issues if it were not! There is no doubt that technology plays a major role in the M-A architectural blueprint, but are machines enough? Can risk be mitigated simply by routing trades through a series of automated checks? The answer is no and it doesn’t appear that in the near future technology will fully take over the process. FX options, total return swaps, structured and commodity products and many other exotics do not have electronic platforms from which to trade, and none of these have systemic, equity-like protocols for booking, settling and processing. As much as one may want automation, the solutions simply have not caught up to the demand. As trading enterprises have moved toward automation for efficiency and cost reasons, the human touch is still a necessary requirement. Think of all the moving parts: negotiated terms, distinct trade structuring, term sheets, margin requirements, multiple sourced fee management, collateral postings, varying settlement instructions and multiple clearing relationships. All require experienced oversight and expertise to manage effectively. In certain parts of the process where there is no standardization, it is nearly impossible to create a cost-effective technological solution that addresses all components in a holistic manner. This is further proof that when structuring trades, the M-A trader needs to consider more than just the execution. The trader must also ensure that important allies in legal and compliance, risk and operations departments understand the design and the desired result of the trades, so that they too can help to fill the gaps that technology currently cannot address. For some, risk is solely an execution problem. Which algorithm offers the best access and protection? Which trading strategy is best suited for the context? When is the right time to attempt to take advantage of liquidity? For the multi-asset enterprise, risk goes beyond the order itself. It’s embedded in the operational infrastructure, in the execution pathways to various venues for various products with various brokers, in the functionality of the OMS, in the reporting platform and in cash/credit profile management. There isn’t one system to manage these risks or one report that can proactively identify them. Multi-asset trading requires a dynamic combination of available technology, broker partnerships, an educated trading team, and belief in the importance of human oversight. Enhancement in risk management for multi-asset trading is an ongoing enterprise. It may never be fully solved, because the products – both investment and tradable – are evolutionary. Like home improvement, as soon as you get the last room the way you want it, the first room needs to be updated. Diligence needs to be the byword and the rule. This document was prepared by Acadian Asset Management LLC. The views expressed within are those of Acadian and are subject to change with market conditions. It must not be construed as investment advice, or an offer to sell or a solicitation of an offer to subscribe or to purchase, shares, units or other investments, or as an endorsement, recommendation, or sponsorship of any company, security, index, strategy or advisory service, or to establish any investment relationship. This document has not been updated since it was published and may not reflect the current views of the author(s) or recent market activity. No representation or warranty, express or implied, is made as to the accuracy, reliability or completeness of such information. Historical economic and performance information is not indicative of future results. The views expressed are subject to change based on market and other conditions. This document may not be reproduced or disseminated in whole or part without the prior written consent of Acadian Asset Management LLC © Acadian Asset Management LLC 2018. All rights reserved.